[Shanghai, June 27, 2018] Mobile World Congress Shanghai 2018 opened at the Shanghai New International Expo Center today. Huawei Rotating Chairman Eric Xu addressed the audience in his keynote speech titled Bringing MBB to a New Level with 5G. Xu expressed his hope that 5G would bring the mobile Internet – especially mobile video – to a level comparable to mobile voice service today, allowing users to enjoy mobile broadband services wherever and whenever they want. Xu also expressed his expectation that 5G would nurture new basic services and drive the sustainable growth of the mobile communications sector. Xu emphasized that 5G standards are the result of joint collaboration between global organizations. 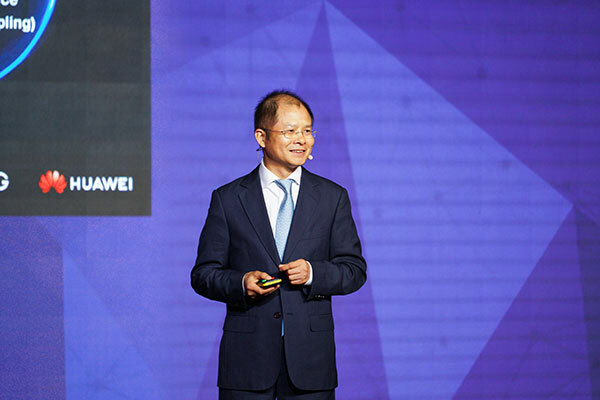 As a major 5G standards contributor and patent holder, Huawei will follow the FRAND principle – Fair, Reasonable, and Non-discriminatory – as it has always done. During the standardization process, Huawei will continue to recommend innovative technologies to other industry players, and will never squeeze other companies or society as a whole. Below is the full text of his keynote speech. At 11:18 on June 14 during a Plenary Meeting, 3GPP approved the freezing of the standalone specifications for 5G New Radio (NR), which marks the official release of the R15 standard. The non-standalone NR specification was released in December of last year. At present, the first phase of full-featured standardization work has been completed. The R15 standard focuses on commercial needs for enhanced mobile broadband (eMBB). It also meets basic needs for uRLLC and mMTC. 5G can deliver a peak speed of 10 Gbps at 100 MHz bandwidth, and 20 Gbps at 200 MHz bandwidth. 5G is set to bring mobile broadband services to a whole new level. I'd like to take this opportunity to pay my tribute to all experts who have worked on 5G standardization and research. Thank you for your incredible work! The 3GPP R15 standard focuses on improving mobile Internet experience. By the end of 2019, R16 and subsequent standards will address the challenges that come along with massive numbers of connections and ultra-low latency, thus enabling industry digitization. 5G technologies, including the LDPC and Polar Codes, result from decades of effort by several generations of basic research scientists. The LDPC Code was first introduced by US professor Robert Gallager in 1963. That was 45 years ago. Polar Code was first proposed in 2008 by Erdal Arikan, a Turkish professor at Bilkent University. That was 10 years ago. 5G standards wouldn't have been possible without decades of global collaboration. 5G supports faster speeds, lower latency, and more connections than 4G. But if we look at the architecture and protocol stacks, it's clear that 5G actually builds on 4G and expands its potential. 5G and 4G use the same architecture. Their baseband units and remote radio units are the same. Their protocols are largely the same. Mobile Internet services remain the bulk of the data traffic flowing in both 4G and 5G networks. Enhanced encryption algorithms and privacy and authentication mechanisms will make 5G more secure. That means 5G will provide better security than 4G. Huawei is a major 5G standards contributor and patent holder. In our official statement released on May 15, Huawei announced our commitment to following the FRAND principle – Fair, Reasonable, and Non-discriminatory – as we have always done in the past. During the standardization process, Huawei will continue to recommend innovative technologies to other industry players, and we will never squeeze other companies or society as a whole. We aim to build a robust 5G ecosystem through fair and open collaboration. Huawei won't seek to squeeze other companies or society as a whole. That means we will stick to the FRAND principle and make every effort to reduce licensing fees for 5G patents. We advocate that 5G patent holders should ensure their cumulative licensing rates are lower and more transparent than 4G. And we are working hard to make this a reality. 5G will support 100 billion connected cellular devices, a number much larger than what a 2G, 3G, or 4G network can support. With a larger market, holders of 5G standard-essential patents are able to get reasonable returns from their R&D investment, though at an IPR licensing rate lower than in the past. Over the past 40 years, the mobile communications sector has fostered two major basic services: mobile voice and mobile Internet (especially mobile video). It has taken 30 years – from 1G to 2G and finally to 3G – for mobile voice to deliver an enjoyable experience, allowing users to use the service whenever they want. The mobile Internet, especially mobile video, appeared in the 3G era and has been growing rapidly in the 4G era, but it has not reached a level as high as that of mobile voice. We hope that 5G will bring the mobile Internet – especially mobile video – to a level comparable to mobile voice service today, allowing users to enjoy mobile broadband services wherever and whenever they want. We also hope that 5G will nurture new basic services such as mobile AR and VR. The first 5G standard focuses on enhanced mobile broadband, which aligns well with the urgent demand of users. This can also be seen in the latest developments of global markets. China Unicom has seen the data traffic per 4G user per month (DOU) rise to 9 gigabytes. The DOU of China Mobile is nearly 5 gigabytes and the number is expected to grow three-fold in the next year. The DOU of China Telecom is almost 7 gigabytes. In Kuwait, the DOU has reached 70 gigabytes. In Saudi Arabia, the number is 35 gigabytes. In Finland, the DOU grew by 43% in a single year to 20 gigabytes. However, 4G networks are hard-pressed to meet current user demand. In other words, users want to consume more, but experience and speeds are falling short of expectations. Take a Chinese carrier as an example. In the top 30 developed cities where it provides services, the average speed perceived by users has decreased by 53%, from 51 Mbps in early 2017 to 20 Mbps. This shows that network capabilities are failing to keep up with user needs and service growth. During busy hours in the hot spots of a major city in China, the uplink rate was only 400 Kbps and the downlink rate was 4 Mbps. User experience is facing a bottleneck in these regions. It is a common problem that user experience is poor in hot spots in developed regions. New WTTx users are expected to outnumber FTTx users, making WTTx a major means of access for home broadband in some regions. On December 12, 2014, SoftBank launched a wireless home broadband service called Air. It offers speeds that can rival fiber and requires no construction. In addition, it offers an unlimited data plan. The service grew rapidly as soon as it was launched, enabling SoftBank to win two million new subscribers within just two years. Air has attracted another special group of users – young people who don't have fixed residences. This is because contracts are flexible and Air subscribers can easily move from one place to another. It only takes one hour from signing a contract to accessing the service. And the service is available immediately after a user moves to another place. Thanks to the rapid growth of Air, SoftBank saw a 70% increase in total data traffic in 2016, with 40% of the growth contributed by Air subscribers. In conclusion, soaring data traffic, deteriorating user experience, and a lack of spectrum resources have made 5G deployment a must in these regions. Over the past decade, mobile carriers have kept their CAPEX basically unchanged even though total data traffic has grown by more than 2,000-fold. CAPEX as a percentage of carrier revenue has declined from 17% to 12%. As the complexity of technology increases, it will become more difficult to cut CAPEX. However, OPEX as a percentage of carrier revenue has risen from 62% to 75% in the same period. And the ratio continues to rise. So in the 5G era, whether we can stop or even reverse the continued increase in OPEX is a key factor to business success. We must make OPEX reduction a strategic priority for 5G. 3GPP has completed the standalone R15 5G specification. And 5G spectrum has been made available in some countries. 5G will soon be deployed on a large scale. To help global carriers roll out 5G networks, Huawei will launch E2E NSA 5G commercial systems on September 30, 2018, and E2E SA 5G commercial systems on March 30, 2019. Huawei will also launch a 5G-ready Kirin chip in 2019, and a 5G smartphone in June 2019. These products will allow consumers that want higher speeds to enjoy an incredible 5G experience as soon as possible. Huawei is ready to work with our industry partners, to invest and to innovate, so that together we can succeed in delivering the 5G mission. Keep me informed of news and offerings from Huawei? Well done! You have been successfully added to HUAWEI’s mailing list, a confirmation email will be sent to your email address shortly.